Description: Lifewit Storage Bags are the ultimate solutions to your out of season items such as beddings to clothing. It is constructed with high quality fabric for exceptional durability. It also Features 2-way zipper closure for easy access of stored items. Reinforced handles allow for easy maneuvering and transport. 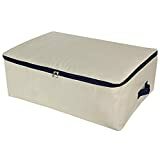 Specification: Materials: Cotton and linen Color: Beige Size: 22.44″x 16.54″x 8.27″ Package Content: 1 x Foldable Storage Organizer Bag Note: The color of the product may vary slightly from the listing pictures due to differences in computer settings. DOKEHOM – Your best home storage assistant: Size 27.5″(L) x 16.5″(W) x 13.8″(H), 100L capacity approx. High Quality Material -600D Oxford Fabric, it has the good tearing resistance and wear resistance capacity. and it is waterproof, moistureproof, dustproof. You can put it in any places and don’t worry the moisture, moths etc. Washing tips – Wipe clean only, do not use abrasive cleaner. – Do not use washing machine to clean the bag, it may damage the waterproof coating. 1, There are mainly three different fabrics made the storage bags. One is non-woven fabric, it is very soft, but it is not washable and short lifespan, it will be broken after half or one year, though it is very cheap. The second is canvas fabric, it is washable, very sturdy and durable, but it is not waterproof, moistureproof. You need to put it in your closet or other higher place. The last one is oxford fabric, Oxford Fabric have many models includes 210D,420D,600D,840D,L200D,1680D etc. . 1680D is one of the best fabric, it has the best tearing resistance and wear resistance capacity. and it is waterproof, moistureproof, dustproof. You can put it in any places and don’t worry the moisture, moths etc. 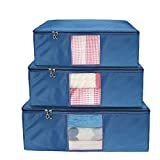 2, This storage bag is washable, collapsible, clean and save easily. 3, You can store anything in it, such as clothes, comforters, beddings, pillows, blanket, toys, groceries etc. 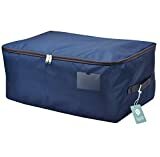 Usually you can find many comforters storage bag on Amazon, and most of them are made of non-woven fabric and have low price, it is very attractive, right? But if you buy and use it, you will find that YOU GET WHAT YOU PAY FOR! 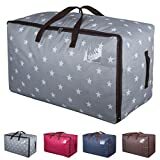 This beddings organizer bag use high quality canvas, very thick and sturdy, the bigger bag is 19.7 oz in total, but the general non-woven bag is under 10 oz. Because of the thick fabric, idea for storage Beddings,Comforters,Quilt,Blanket,Pillows,Garments,Sweaters etc. the all season items in home. The bag is foldable and washable, in washer or by hand. both OK.